The AeroPress is the ultimate gift for any coffee lover. It allows the user to make and enjoy smooth, rich and flavoursome coffee quickly and easily. Whether it's at home, in the office or overnight at a hotel that extra special cup of coffee is literally seconds away. The unique brewing style of the Aeropress allows the use of a finer grind maximising the depth of flavour and applies pressure to squeeze out every last ounce of goodness from the grounds. 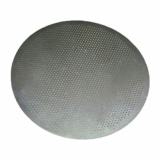 A micro-filter is used to maximise the purity of the coffee, ensuring every drop is as smooth as possible. 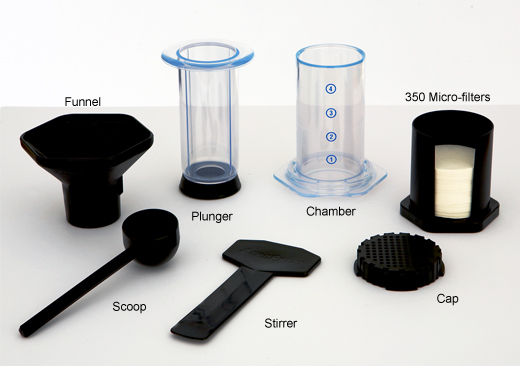 It produces an easily disposable puck of coffee (as simple as removing the cap and pushing the plunger) and can be cleaned in a matter of seconds. Professional baristas and coffee roasters agree that the AeroPress has the ability to produce the same quality coffee as a machine worth hundreds of pounds. Gone are the days of hard to clean fragile cafetiere and cumbersome overpriced home coffee machines. This innovative coffee maker is truly value for money, beautifully simple to operate and is the perfect gift to explore the world of coffee. Why not make a delicious caffeine-free super-healthy Red Espresso with your Aeropress? Or why not add some our Ma's Kitchen fair trade coconut milk and blend a delicious 'bullet-proof' coffee? Over time the original rubber seal of your AeroPress will wear and shrink - so please consider buying a replacement seal to extend the life of the product. The Aeropress is made from BPA and phthalate-free materials. 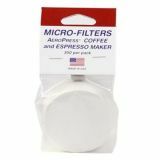 350 micro filters - enough to last a while! Simply follow these six easy steps and enjoy a truly amazing cup of coffee. Slow down the process if you want a fuller flavour! The Aeropress is manufactured by American company Aerobie Inc. Aerobie is owned by Stanford engineering instructor Alan Adler who invented the groundbreaking Aerobie flying ring. His Aerobie Pro flying ring was used to set a Guinness World Record for the farthest throw when it was thrown an incredible 1,333 feet (406 meters). The Aeropress is Alan's latest invention. Created in 2005 after years of work designing the perfect way to manually extract coffee it is now an international best seller.